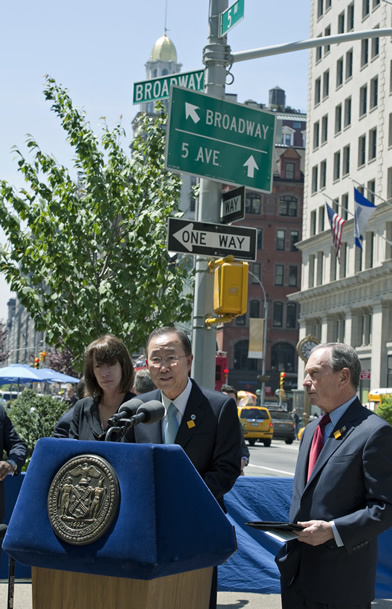 Photo: UN Secretary-General Ban Ki-moon (at podium) speaks at a press event to launch the Decade of Action for Road Safety, alongside Mayor of New York Michael Bloomberg and Jeannette Sadik-Khan, New York City Transportation Commissioner, in Manhattan, New York. May 12, 2011. United Nations, New York. UN Photo/Eskinder Debebe. Photo: UN Secretary-General Ban Ki-moon (left) receives a helmet and campaign pin from Michelle Yeoh (right), actress and Global Ambassador for the Make Roads Safe campaign, who met with Mr. Ban to promote the “Decade of Action for Road Safety”. United Nations, New York. UN Photo/Eskinder Debebe.